A natural pearl pendant that was once owned by Queen Marie Antoinette and smuggled out of France just before her arrest in 1791 fetched $36.1 million at Sotheby’s Geneva last week. Aggressive bidding elevated the price to more than 18 times the pre-sale high estimate and demolished the previous record for the highest price ever paid for a natural pearl. The former title holder was La Peregrina, a pear-shaped natural pearl that was sold at Christie’s in 2011 for $11.8 million as part of Elizabeth Taylor’s collection. 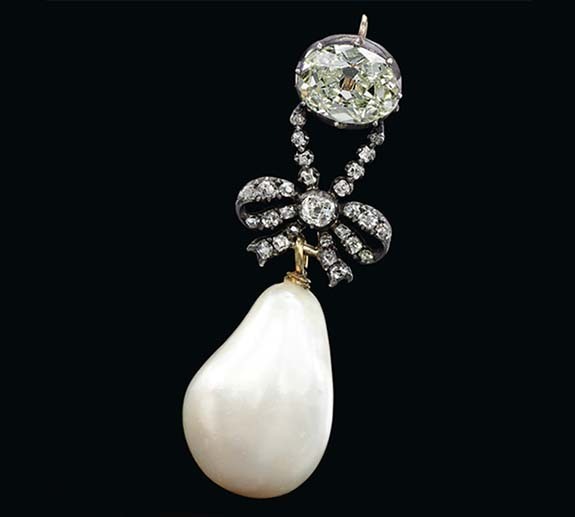 The ill-fated French queen’s natural pearl and diamond pendant is set with an oval diamond in a diamond bow motif. The slightly baroque drop-shaped natural saltwater pearl measures approximately 15.90mm x 18.35mm x 25.85mm and originally hung from Marie Antoinette’s three-strand pearl necklace. The pendant entered the auction with a modest pre-sale estimate of $1 million to $2 million. With a revolution raging in France in March 1791, Marie Antoinette and her husband, King Louis XVI, prepared to flee the country. The queen wrapped her most precious jewels in cotton and packed them neatly into a wooden chest. The diamond, ruby and pearl treasures were secretly shipped to Vienna in the care of Count Mercy Argentau, a loyal retainer to the queen. “The jewels made it, but unfortunately, she did not,” Mascetti said. Three months later, the royal family was captured in Varennes as they were trying to leave France. Both Louis XVI and Marie Antoinette were imprisoned and executed by guillotine in 1793. Their last surviving child, Marie-Thérèse, was finally allowed to flee to Vienna after serving three years in solitary confinement. There, the teenage princess reclaimed her mother’s jewels that had been kept safe by her cousin, the Austrian Emperor Francis II. The jewelry remained in the queen’s family for the next 200 years and had never been seen by the public — until they went on a promotional tour in the lead-up to Wednesday’s auction in Geneva. The pendant was among 10 exquisite pieces that once belonged to Marie Antoinette, all of which attracted fierce bidding. Together they realized a total of $42.7 million against a pre-sale estimate of $1.6 million to $2.9 million. A beautiful three-strand necklace strung with 119 natural pearls also saw intense bidding. The final price of $2.3 million far outperformed the estimated price of $200,000 to $300,000. The queen’s jewelry was part of a larger auction collection comprised of 100 pieces from the Bourbon Parma family — a family linked to the royal dynasties of France, England, Spain, Austria, Holland and Italy. According to Sotheby’s, international collectors and history lovers demonstrated the full force of their fascination with the storied treasures. Participants represented 43 countries.